Industrial Test Systems Inc., of Rock Hill, S.C., has announced the release of a patent-pending new test strip. 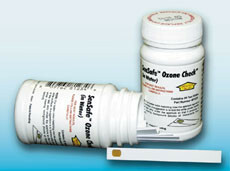 SenSafe Ozone Check is a unique test strip that’s designed to test for levels of ozone in water. Reporting levels at 0.05, 0.1, 0.2 and 0.3 ppm, the test strip gives accurate results in only 30 seconds. The low detection ability with this strip is possible because of the unique aperture feature. The simple dip-and-read procedure makes testing easy, as no technical experience is required to run the test.